The Galapagos Islands lie nearly 1000 kilometers east of the mainland of Ecuador in the Pacific Ocean. Visited in 1835 and made famous by Charles Darwin, the archipelago consists of 19 volcanic islands, originally uninhabited by human beings. They are noted for the fearlessness of the animals that have never experienced human predation, and of course for their unique characteristics that led Darwin to develop the theory of evolution. The Galapagos Islands boast many fine beaches with white sands and crystal clear waters, teeming with animal life both on the shore and beneath the water line. From seals and marine iguanas to sharks, manta rays and even penguins, it is easy to get up close to enjoy this once-in-a-lifetime experience. Inland too there is much to see, from the lava fields and lava tunnels to the giant highland tortoises. There is great hiking and mountain biking in addition to bird-watching and animal spotting. This is the first island in the Galapagos Archipelago Charles Darwin visited on the Beagle. This islands hosts frigate birds, sea lions, giant tortoises, blue- and red-footed boobies, tropicbirds, marine iguanas, dolphins and swallow-tailed gulls. The largest freshwater lake in the archipelago, Laguna El Junco, is located on San Cristóbal. Puerto Baquerizo Moreno, lies at the southern tip of the island. Santa Cruz hosts the largest human population in the archipelago, the town of Puerto Ayora. The Charles Darwin Research Station and the headquarters of the Galápagos National Park Service are located here. The GNPS and CDRS operate a tortoise breeding center here, where young tortoises are hatched, reared, and prepared to be reintroduced to their natural habitat. The Highlands of Santa Cruz are famous for the lava tunnels. Black Turtle Cove is a site surrounded by mangroves, which sea turtles, rays and small sharks sometimes use as a mating area. The island's seahorse shape is the product of the merging of six large volcanoes into a single land mass. On this island, Galápagos penguins, flightless cormorants, marine iguanas, pelicans and Sally Lightfoot crabs abound. At the skirts and calderas of the volcanoes of Isabela, land iguanas and Galápagos tortoises can be observed, as well as Darwin finches, Galápagos hawks, Galápagos doves and very interesting lowland vegetation. The third-largest human settlement of the archipelago, Puerto Villamil, is located at the southeastern tip of the island. The island is also known as San Salvador, after the first island discovered by Columbus in the Caribbean Sea. Marine iguanas, sea lions, fur seals, land and sea turtles, flamingos, dolphins and sharks are found here. Darwin finches and Galápagos hawks are usually seen, as well as a colony of fur seals. At Sulivan Bay, a recent (around 100 years ago) pahoehoe lava flow can be observed. This island is formed by the remaining edge of a large caldera that is submerged. At Darwin Bay frigatebirds and swallow-tailed gulls, the only nocturnal species of gull in the World, can be seen. Red-footed boobies, noddy terns, lava gulls, tropic birds, doves, storm petrels and Darwin finches are also in sight. There is a large Palo Santo forest. Floreana is one of the islands with the most interesting human history, and one of the earliest to be inhabited. Flamingos and green sea turtles nest on this island. The patapegada or Galápagos petrel, is found here. At Post Office Bay, since the 18th century whalers kept a wooden barrel that served as post office so that mail could be picked up and delivered to their destinations. At the “Devil's Crown”, an underwater volcanic cone and coral formations are found. Española is the oldest island at around 3.5 million years, and the southernmost in the group. Due to its remote location, Española has a large number of endemic species. It has its own species of lava lizard, mockingbird, and tortoise. Española's marine iguanas exhibit a distinctive red coloration change during the breeding season. Española is the only place where the waved albatross nests. Española's steep cliffs serve as the perfect runways for these birds, which take off for their ocean feeding grounds near the mainland of Ecuador and Peru. Also known as South Seymour, Baltra is a small flat island located near the centre of the Galápagos. It was created by geological uplift. The island is very arid, and vegetation consists of salt bushes, prickly pear cacti and palo santo trees. This island was formed from a series of geological uplifts of submarine lava along Baltra and Santa Cruz. The island is home to a large population of blue-footed boobies, estimated at nearly 2,500. Swallow-tailed gulls, blue-footed boobies, common noddies, and frigate birds are also present in great numbers. The three dive sites around North Seymour provide good opportunities for observing sea lions, large school of fish, sharks, rays, and sea turtles. North of Santa Cruz are two islands located that make up the Daphnes: Daphne Minor and Daphne Major. Both islands are tuff cones and are quite barren. Out of the two, only Daphne Major is allowed to be visited, although a special permit is necessary. Daphne Major is home to the Nazca boobies, red-billed tropicbirds, and blue-footed boobies that nest on the site. If you’re a diver, the marine sites are not to be missed. Here you can observe sea lions, sea turtles, Eagle Rays, different shark species, benthic organisms, and sea horses. The main attraction of this small island is the impressive stone arch formation, better known as Darwin Arch. The arch is home to sea birds, many of which are endemic species. The rest of the island is not very popular in terms of land tourists. The marine wildlife, however, is a must-see for any professional diver. 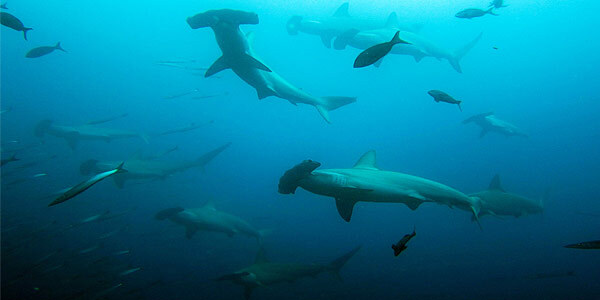 The marine sites are known for its large schools of hammerheads that pass by quite frequently. Other marine life present are sea turtles, manta rays, dolphins, schools of pelagic fish species, and various shark species. The island Fernandina is most famous for its famous for its continuing series of eruptions, with the latest one having happened in 2009. Since the establishment of the Galapagos National Park, there has been 13 eruptions recorded, with a few eruptions that lasted for days. The visitors’ site Punta Espinosa is home to Flightless Cormorants, penguins, sea lions, Sally Lightfoot Crabs, Galapagos Hawks and land iguanas. Marine Iguanas nest at Punta Espinosa, where the young emerge around June. The site is also one of the best places to observe the Lava Cactus. The diving sites around the island are great for seeing penguins, sea horses, marine iguanas, sea turtles, different types of sharks, and rays. Off the east cost of Santa Cruz are two islets that make up Plazas. The visitors’ site South Plaza Island is famous for its extraordinary flora. The endemic Galapagos carpet weed Sesuvium changes from bright green in the rainy season to red, orange, and purple during the dry season. The landscape also carries prickly pear cactus trees. In terms of the animal life, South Plaza is great for observing Red-billed tropicbirds, swallow-tailed gulls, land iguanas, marine iguanas, and sea lions. This landscape of this relatively small island consists of steep slopes, rocky coastlines, and small volcanic craters with distinct red colors due to the high percentage of iron in the lava. Marine iguanas and sea lions can be observed at the visitors’ site, as well as Brown Pelicans that nest in the salt brush behind the beach. Blue-footed and Nazca boobies are also not to be missed at the site. Behind the beach there is a saltwater lagoon, which creates a feeding and breeding are for flamingos. The flamingos feed on the pink shrimp larva and water boatmen, that give the birds their pink color. Pintail Ducks and Common Stilts share the lagoon with the flamingos. Finches, Galapagos Doves, Yellow Warblers, mocking birds, and snakes can be seen at the site as well. At the marine site divers can observe sea lions, sea turtles, Eagle Rays, Garden Eels, sharks, penguins, and a small colony of fur seals. Santa Fé is home to two endemic species: the Santa Fé land iguana, and the Santa Fé rice rat. The visitors’ site Santa Fé is great for observing sea lions, massive Santa Fé Opuntia cacti, land iguanas, and Galapagos Hawks. There are 3 marine sites: El Fondeador, La Encañada, and Costa Este. These are great sites for observing sea lions, sea turtles, various species of rays, and Galapagos Sharks. Bartolomé Island is the most visited and most photographed island of the archipelago. The visitors’ site Isla Bartolomé has a summit that provides a spectacular view of Pinnacle Rock, which are the intense black lava flows at Sullivan Bay and the rest of Santiago Island. Other volcanic formation such as spatter and tuff cones, and lava flows can be seen at the site as well. At the northern beach, visitors are allowed to swim and snorkel, where green sea turtles can be observed as well as colorful fish, sea lions, Galapagos Penguins, stingrays, Spotted Eagle Rays, and Black-tipped Sharks. The Galapagos Calendar . . .
• The heat of the sun is intense. Air temperature can reach up to 35C and humidity is high. • March 21st signals the arrival of the waved albatross (Phoebastria irrorata) on Española Island. • Snorkelling is excellent at Punta Vicente Roca (Isabela). Penguins are still active in the water, swimming with the tropical fish. • The south east trade winds return and the currents become a bit stronger. Seas pick up in surge and wave action. 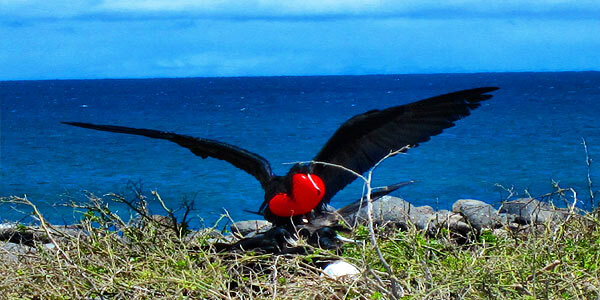 • The Frigate birds on North Seymour begin their typical display with their large red inflated pouches. • Southern migranting birds start their journey towards the north. Galapagos is a rest stop for such birds. Some species of cetaceans also follow this pattern of migration. • The sea bird communities are breeding, especially the Blue Footed Boobies on Española. • Great month to see the four stages of nesting of the Blue Footed Boobies: eggs, chicks, juveniles and young adults. • Sea lions start to give birth (pupping). This can best be viewed on the western islands. • Sea lions are very active in September. The females have reached oestrus stage, and so harem-gathering males are constantly barking and fighting. Shore fighting is heavy. Western and central islands are the most active ones in terms of sea lions' activities. • The mountain summits are clear, but low-lying fog covers the shoreline. • Pupping of sea lions continues. • The genus Physalia is commonly seen floating around Gardner and Tortuga Islets. Some can also be seen stranded at the shores of the Flour Beach at Floreana. • In November the seas are calm. South east trade winds have decreased strength. Water temperatures are slowly rising. • Sea lion pups (especially at Champion Islet) play next to the snorkelers with pups being especially curious of the swimmers. The average age of most pups is 3-4 months. • The rainy season begins; all of the plants of the dry zone produce leaves. Galapagos becomes "green"
Click to go to the main Galapagos Adventures page! 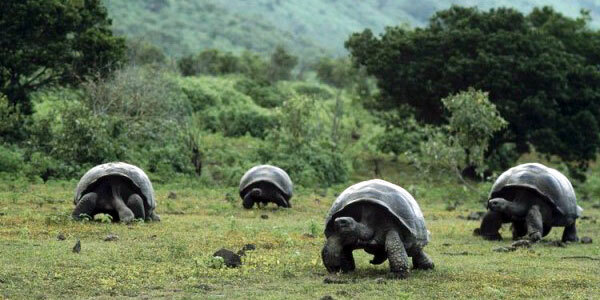 Click for last-minute Galapagos options! Even though the archipelago is located on the equator, the weather is not tropical. With temperatures that range from 21 to 30 degrees Celsius, it offers good weather for visiting the islands all year round. In the Galapagos there are two seasons: dry season and warm season. From June to December, the southern trade winds bring the colder Humboldt Current north to the Galapagos, which introduces the Galapagos dry season. During this season the water is cooler, which makes the water clearer for those who love to dive. In the sea and around the islands there are large numbers of different species during the dry season, namely: giant tortoises, humpback whales, blue-footed boobies, cormorants, oyster catchers, lava lizards, Galapagos hawks, masked boobies, swallow-tailed gulls, sea lions, lava herons, brown noddies, and penguins. 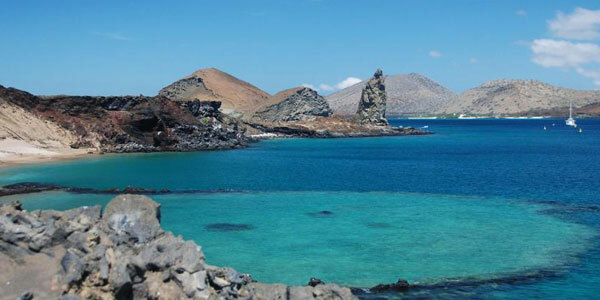 The Galapagos warm season takes place from December to May. During this season the climate is more tropical. On land and ocean temperatures are very pleasant, which creates the perfect opportunity for swimmers and snorkelers to get into the water. Because the weather is warmer, clouds often cover the sky and daily rain may occur. The animal species flourishing during this season are marine iguanas, sea turtle, land iguanas, flamingos, white-cheeked pintails, masked boobies, albatross, and blue-footed boobies.